" Yipes!" blinked the itzy bitzy rabbit. " What are you going to do?" " Have my lunch, growled the bear. " And my lunch is...YOU!" Poor old Grizzly Bear, there was nothing left to eat in the woods. Because he had eaten it all! From tasty toes to biting in half, this bear means business when he comes across the rabbit. But unlike other animals Rabbit is not scared. He has intriguing reasons why the bear should not eat him for his lunch and it works! 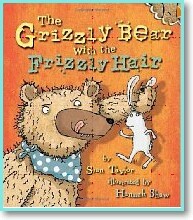 A great story in a picture book retold in a very appealing way. The drama, the pictures, the way it is presented and the rhyming text make it a joy to read and to share. It comes from Sean Taylor and illustrated by Hannah Shaw,the team who put together Crocodiles are the best Animals of All- short listed for the Roald Dahl Funny Prize 2009.Newly published by Frances Lincoln, this book is a great one to read and to buy. Jackie Morris's latest book The Ice Bear is newly in print this month with Frances Lincoln. Set in the pristine polar regions of the Arctic, this is a beautiful story with illustrations that are just amazingly powerful. It brings emotions to the surface, and is a reminder of our responsibility to the world's animals and wildlife. Polar bears, for instance, can show us the best ways to use natural resources, even in the wildest of places like the Arctic. Jackie also has exhibitions across the country. Imagine Gallery at Long Melford in Suffolk is currently holding an exhibition of illustrations including cheetahs and the contemplative White Hare. In October Dolphin Booksellers are hosting and sponsoring an event in Cambridge with Jackie at Babraham C.of E. Primary School. Young children learning, creating and using illustrations and books to fire imaginations. You can see Jackie's books and illustrations, plus cards to buy on her website. It's definitely worth a visit. We are working with a school in East London in February to deliver one our City Stories author and book events.Leyton Stories is the children's book group based around the school and children's centre in Leyton. We are working with the school, the publishers Frances Lincoln and over a hundred children to undertake workshops and author meetings with parents and carers. The event is part of our City Stories project - designed to deliver books, authors, illustrators and story-tellers to inner city children. Watch this space in February to see how it went.